Computer Dynamics provides you with the toughest industrial LCD monitors available in the industry. 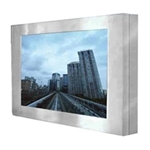 We offer flat panel industrial LCDs with your choice of mounting options that are capable of operating under extreme conditions such as heat, sunlight, and dust as well as in the presence of corrosive elements. Whether you need a display tough enough to withstand environments commonly associated with marine locations, military operations, or industrial facilities, you can trust the industrial LCDs from Computer Dynamics to provide you with years of durability in the harshest setting. Most of our industrial LCD displays are sunlight readable and many are available with optional resistive touchscreen technology. The SeaBrite LCD monitor offers brightness control for various ambient lighting conditions with active matrix color TFT LCD which is available as standard equipment on the VAMP-WN. Capable of operating in temperatures up to 131° F, our industrial LCDs are designed to be corrosion resistant as well as resistant to shock and vibrations. Depending upon the display you select, options are available for each so that your system is fully robust to meet the demands of your workplace. Contact us today with your specifications and learn more about our products.